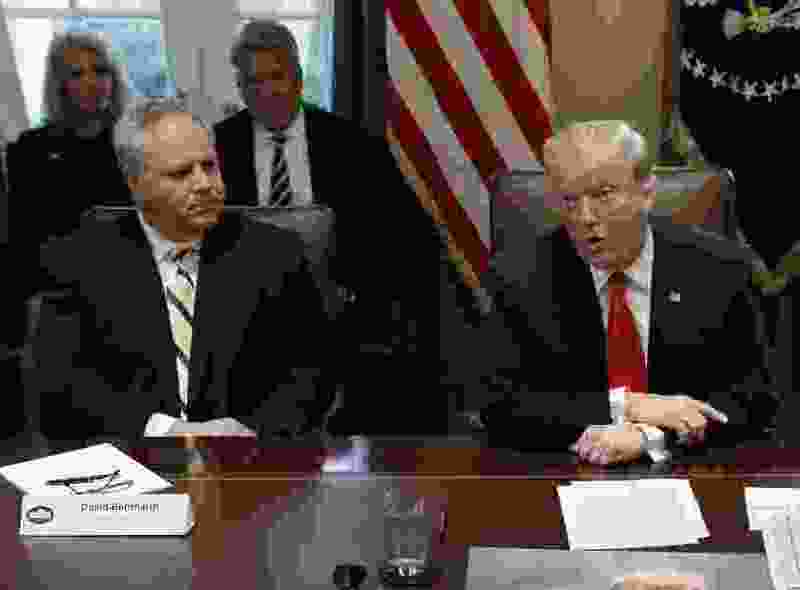 (AP Photo/Evan Vucci, File) In this Jan. 2, 2019, file photo, President Donald Trump speaks during a cabinet meeting at the White House, Wednesday, Jan. 2, 2019, in Washington, as Acting Interior Secretary David Bernhardt listens. The Senate confirmed Bernhardt to his post Thursday. The 56-41 vote Thursday promoted Bernhardt from the department's acting secretary, a job he assumed after his predecessor Ryan Zinke resigned amid numerous investigations into his behavior and management of the agency. Bernhardt had served as Zinke's deputy until his departure in December. Bernhardt's extensive experience at the Interior Department, where he served as solicitor during President George W. Bush's administration, was cited by his supporters who said he is more than qualified to lead the agency. But his work as a lobbyist for the oil and gas industry in the West, as well as large water utilities, led to concerns about conflicts of interest. The Interior Department oversees 700 million acres of public lands and 1.7 billion acres offshore, and it works closely with some of Bernhardt's former clients. Bernhardt has so many potential conflicts of interest that he carries an index card listing companies and people he should avoid. Concerns over ethics led to a heated confrontation between a Democrat who opposed Bernhardt's nomination and a Republican who opposed it at his confirmation hearing. "Why would you come to my office and lie?" Wyden asked. The actions "make you sound like just another corrupt official," the lawmaker said. Wyden's statement was immediately countered by Bernhardt's friend and fellow Coloradan, Sen. Cory Gardner, a Republican who said Democrats exhibited a double standard by supporting former Interior Secretary and petroleum engineer Sally Jewell but not Bernhardt. In the end, the Energy and Natural Resources Committee approved Bernhardt's nomination by a 14-6 vote. Several Democrats joined Gardner and Chairwoman Lisa Murkowski, R-Alaska, in supporting the nominee. "I need to be able to pick up the phone and talk to the secretary of interior on a regular, regular basis because these things have direct impacts on New Mexico," Heinrich said Wednesday. "We didn't win the election in 2016, so I'm not going to get my choice for secretary of interior. In the meantime, I have to be able to work with these folks." Heinrich expressed particular concern about potential oil and gas drilling in the Chaco Canyon area near massive stone ruins considered sacred to the descendants of the ancient Pueblo civilization: "I'm going to put my state, and the protection of public lands in my state, ahead of the sort of political battle that happens in Washington, D.C."
On the day of the Senate vote, Gardner again denounced Bernhardt's opponents and said the "Washington, D.C., political smear machine has been working overtime" to bring down a good man. Sen. Amy Klobachur, D-Minn., said Thursday that she opposed Bernhardt's nomination for several reasons, including his role in weakening enforcement of the law to protect birds and "stacking the deck in favor of the fossil fuel industry." Like other Democrats, Klobachur decried his actions to limit opportunities for the public to comment on the department's policy decisions and Bernhardt's directive to agency employees to not factor climate and environmental effects into guidance. Under Bernhardt, she said, the Interior Department has downplayed climate science and has made decisions and rules "that will accelerate its effect. The question is not is it happening . . . the question is what will we do about it," she said.